The ever popular, ultra stylish, FrancisFrancis X1 coffee machine is available in three varities; the number one seller - GROUND coffee only - plus TRIO ESE POD only and IPERESPRESSO CAPSULE only machines. Also available is the IPERESPRESSO capsule only X7.1 machine, utilizing illy's new innovation - the iperEspresso capsule. It's easy to use and produces perfect results every time. 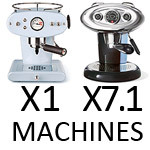 Occasionally, we have 'in-house' refurbished X1 machines listed for sale, reconditioned from the ground up. 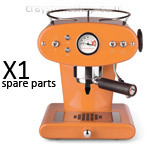 Worth considering if you want a design classic coffee machine at a discounted price. All your spare parts requirements for your FrancisFrancis machine can be found here. If your machine is tripping the household fuses you'll need a new heating element. If you're having problems with leakage then we have all the seals you'll need. If you want to freshen up your machine, there's water tanks, pipes, drawer fronts and drip trays. If there are any parts you require that are not listed please send an EMAIL and we'll get you a price. NOTE: Only competent persons should attempt repairs. We accept no liability arising from incorrectly fitted spare parts. No warranty is available on spare parts that are self fitted. Unwanted or incorrectly specified parts cannot be returned. If in doubt please enquire about our repair services. Where can I get my FrancisFrancis coffee machine fixed? Even if you're not local to us, you can send your machine inexpensively, using our courier contacts, and we will repair and service and ship back to you. Perfect! 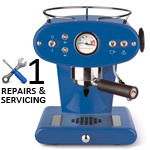 If you're not getting the best out of your machine, if your household fuses are tripping, your temperature gauge has stopped reading, you have poor water pressure, a loss of steam and water/coffee leaking from the group head/handle area, then your machine would greatly benefit from being serviced. We offer a comprehensive repair service, from a basic service to a full strip down and refurbishment, please EMAIL us for more information and we'll reply with all the information to guide you through the process. We also have packaging tips and a proven, inexpensive courier - getting your machine to us has never been easier. 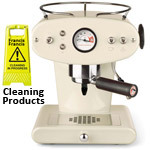 Cleaning products for FrancisFrancis coffee machines to help to keep your machine in top condition. Regular descaling is the safest and easiest method to protect your machine and to extend its lifetime. Cleaning the group head shower filter is also very important as hardened coffee can very easily cause blockages, leading to pressure problems as the water can't get through - simply clean it with a group head brush - easy! Look after your machine and it will continue to make great coffee for many years to come. 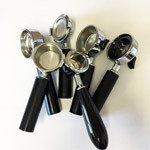 Replacement coffee handles for X1 1st, 2nd and 3rd Generation and also X2, X3, X4, X5, X6, X7 and X7.1 machines. Getting the correct replacement handle for your machine can be a confusing task. We make it easy for you. 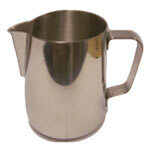 We have all the variants available, in some cases the ONLY stock of certain handles. If you're not sure what you need, if you want to know if your machine can use another handle, or if you have any FrancisFrancis coffee handle questions, send us an EMAIL. It always helps to receive a digital photo of your existing handle along with a photo of the group head. If your handle is lost, broken or you just want an additional handle to become the quickest barista there is, we've got all the variants available. Every day, 5 million cups of illy coffee are enjoyed around the world. illy is perfectly balanced, with a delightful distinct taste and aroma, expertly blended using high quality Arabica coffees. The pressurized packaging ensures that the fresh taste and aroma is preserved. Choose illy and you can be sure you get the same signature outstanding quality, taste and aroma, time after time, cup after cup. We've got illy pods, ground, capsules and beans in standard, decaf, dark roast and lungo for your enjoyment.